With this issue, Gecko Time introduces a new feature: brief interviews, conducted and produced by Shannon Hiatt. Gecko Time’s previous interviews were published in standard interview form with alternating quotes from the interviewer and the person being interviewed. Shannon, who has already written several interesting articles for Gecko Time, presents this interview as a narrative, combining his very readable style with the content he has acquired through direct contact with his subject. 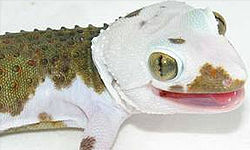 Imagine the gecko hobby without the Halloween Mask (HM) morph. You know, the one with the bold head pattern. Albey Scholl almost didn’t get the chance to develop the Halloween Mask trait. Yes, that’s right. Although I happen to think that would be a loss for Leo breeders, others would simply poo poo the notion and yawn. Well to each . . . you know the rest of that passé phrase. In 1997 Albey was at the National Reptile Breeders’ Expo in Orlando and stopped by to see what Ron Tremper had at his table. That’s when Ron told Albey an interesting story. Seems he had one-hundred plus Leos with him and he was in a bind. That large consignment was supposed to be picked up by a Japanese buyer. In a twist of fate, (OK, sheer luck for Albey, and those of us who value the HM trait) that buyer attempted to smuggle some protected turtles through Canada and was caught. Needless to say, but I’ll say it, he didn’t make it to Orlando to pick up his order. Since Ron hadn’t been paid for the geckos, he did what Ron is good at. Put them up for sale at his table. 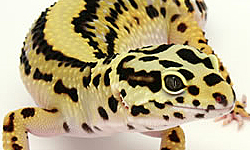 Most of the Leos were in the $400 to $1000 each price range, typical at the time for a Ron Tremper Leopard Gecko. Ron had several Jungle geckos on the table that had strong head markings, but Albey noticed one with an odd, really heavy face mask pattern. “Sort of like an Iron Cross pattern,” is how he described it. 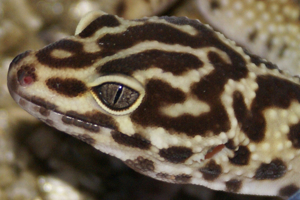 Ron called these geckos “Halloween Masks.” Albey thought that the little female had such an interesting look that he bought her. In addition to the distinctive face mask, she also had a jungle pattern. In those days the Leo hobby was rather restricted in regards to the morphs available. Oh, yes, I remember my fascination with the few boldly marked, distinctive jungle-patterned geckos that could be found online or at herp expos. 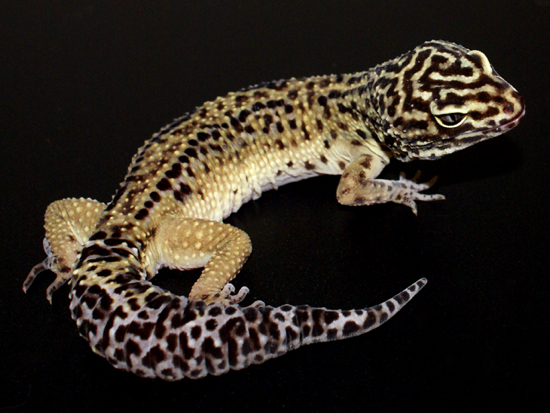 Slim pickings, indeed, but that pattern morph made up one of the two groups of Leos I bred in the late ‘90s. According to Albey she was a slow grower, quite slight of frame, and it took two years before she reached breeding weight. When she did, he selected one of his robust Tangerine males as a mate. 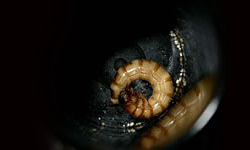 He notes that the distinctive face mask trait mostly disappeared in the resulting F1 offspring. In turn he bred her back to a son, and from the F2 cross he selected the best male to cross back to the F1’s. From that point on he simply did what Albey is best at—line bred the Halloween Masks to set the trait. Think of his Line Bred Snows, Torrid Tangerines, and Tangerine Dorsal Striped Leos, if you will. Now you’ve got it! Although other breeders bought Halloween Masks from Albey, he passed the project on to Paul Allen at Bright Albino, around 2008 I believe, where they reside today. So . . . if you have a Leo with a Halloween Mask, thank your lucky stars. That trait might have wound up in Japan, only to be lost to us. It could happen! Editor’s note: Thank you to PacHerp (Pacific Herpetoculture), owned and operated by Brittney Gougeon, for the photos and video in this article. According to Brittney she is the first breeder to produce halloween masks after Paul Allen of Bright Albino. Great interview, thanks for sharing! 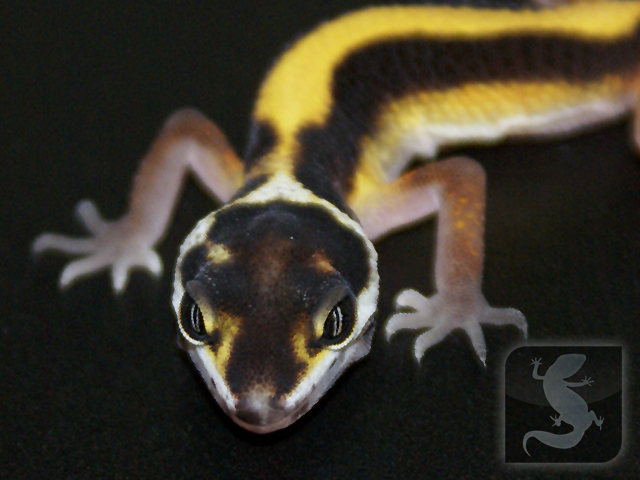 I really enjoyed getting to know the history of this morph. I saw my first Halloween masks in Paul’s collection a few years ago when he asked me to come down and photograph some geckos for him. Loved the info, getting my first halloween mask this week! I am so excited, could you perhaps send me the list which from halloween masks could be formed from?